A nice article today on Wine 101, one of our sponsors for the Summer Music Concerts (along with Framed). Welcome. President Dave Bechtel called the meeting to order at 7:10. Board members introduced themselves. Treasurer Deb Maldonado showed everyone new WCA membership cards that can serve as proof of membership to vote at meetings. Connie Matheson was unanimously elected to Vice President. Mark Foran was unanimously elected to Secretary. Library Committee: Connie reported that on April 27 the Books and Booze fundraiser was held. Like last year, the event was a great success, more than 70 in attendance, great involvement of the local merchants in support of a raffle, and most importantly the event raised $2,300 for the library. Last year’s fundraiser funded many great additions to the library including children’s activities, books, films, and learning materials. Music Committee. Jan Kasienko announced that the 5th year of the WCA summer music series will begin in June. June 13 is jazz, July 11 is a singalong, and August 8 is classical. Times are 6-8 pm at Denicola Park on Treadwell Street, and the committee is still working on a rain location. Scott Matheson suggested renting a large tent in case of rain; Janet said that would be considered. Hamden has a lot of great artists, many phenomenal painters, writers, musicians, etc. The town is trying to create a cultural centerpiece in the town center. The question is how to spread the word not only within Hamden but also regionally. This year’s summer outdoor concerts in town center will focus more on local talent and will have a jazz night for the first time. This year will also feature reggae, disco, and 70s rock. Julie suggested that the WCA and other groups send information on neighborhood events like the Summer Music Concerts to her and she will promote them. Presentation by Mark Austin, Hamden Town Engineer. Mark Austin talked about the proposals for Mather and Waite Street bridge redesign. In the past the proposed project was criticized for being inappropriate for the neighborhood, and the town lost the grant money that would have funded it. This year that same grant pool was not funded by the state, but it will take three years for design and approval, so the town is starting the input process now in hopes of qualifying for grants in future and having citizen support moving forward. Using a response poll requesting opinions and ideas for the project, Mark said he has already received a lot of responses from the public indicating what they want to see in this project. Anyone can respond; the link is https://www.surveymonkey.com/r/3NJ867X. Currently, responses are 50-50 from Spring Garden and Whitneyville. The previous plan was to widen the bridge for truck traffic. Is that the plan this time? Mark’s response: To get funding outside of the local government, projects must provide for access to trucks. Given the age and condition of the bridges, the best course is to close both structures at the same time during construction. Also, it is key that the town ensure there is not diminished water capacity in the neighborhood. Mark’s response: Ensuring water capacity is required and standard in any project of this nature. Will there be sidewalks? Mark’s response: The current conceptual plan shows sidewalks from both the north and south that will be connected to newly built sidewalk extensions on Waite and Mather. The town can put lights on the bridges, not huge cobra lights but pedestrian sized lighting. The ongoing challenge to solving traffic issues is that Mather is viewed as a pass-through, and Whitney is a state road, and the neighborhood as a result loses walkability. Mark’s response: There are limited east-west through streets in this area of Hamden, but there is discussion at the state level of turning roads like Whitney into local roads — and in fact that has long been a state recommendation — but the state ignores their own recommendations. Cheshire has a stoplight pedestrians can press to stop traffic just for pedestrians. Mark’s response: There are two different ways to accomplish this, but he is not sure which mechanism would work. The town should widen the bridge but not the road! Mark’s response: The roads can stay narrow, and will be required to have guard rails. What will be the aesthetics of the projects? Mark’s response: Stone or faux stone can be used to improve the look of the project. One concern is the rise of the road on Mather as it approaches Dixwell due to speeding. The road there is already raised enough. Mark’s response: He has a concern about the aesthetics of that idea, and suggested that the rise creates a separation between the industrial nature of Dixwell and the Whitneyville neighborhood. Is the town trying to modify poor driver behavior? Can the police increase their enforcement of traffic laws? Wouldn’t that be more cost effective? Can stop signs help slow down speeders? Mark’s response: The Hamden police have been stepping up their enforcement. Another way to slow traffic and increase safety is to construct a three-way stop at the Waite-Mather intersection. That would slow down traffic as would a circle in that location. Mark also announced that Hamden received a $2.8 million grant for various sidewalk improvements including Davis Street and Treadwell Street to the bike trail. He also noted the schedules for replacing sidewalks in Hamden, which unfortunately has a very long list of streets. One person asked about Caroline Street, which needs serious help. Mark stated that repairs are prioritized by when the complaint is received by the town. They are placed on a to-do list and handled sequentially. The only way around that system is when a street poses an imminent danger from an engineering perspective. Caroline Street is on the to-do list. To get a street on the list, go to Hamden.com and find the link to the street complaint app. New Business. Dave asked participants if they had any new business. One participant noted the recent incident at the Children’s Center; he had expected this to be a topic of tonight’s meeting. Dave acknowledged that citizens were concerned about recent events connected to the Children’s Center, and brought up the idea of a community discussion of the issue. He said the subject was not on the agenda tonight (the speakers had been engaged prior to the incident), but the WCA will be working on setting up a meeting that approaches the ongoing issues with a broader perspective. There was a recent meeting between several residents, the Children’s Center and the Hamden Police which could serve as a model. Other participants suggested trimming trees along Putnam Street (they can submit request via See-Click-Fix at http://www.hamden.com/seeclickfix), and supporting a neighborhood clean-up. The WCA had sponsored clean-up days in past years but had low participation. Adjournment. The meeting was adjourned at 8:50. 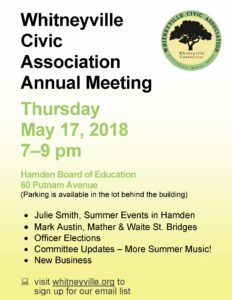 Pleased by advised that the Board of the Whitneyville Civic Association supports the proposed Mill River Watershed Stormwater Mitigation, Habit Enhancement, and Public Education Project sponsored by the Town of Hamden. As a community located downstream of the proposed project, we appreciate the positive impact that it will have on water quality within the Mill River watershed. And as residents of the Town of Hamden, we welcome the educational and passive recreational benefits that will accrue as well. Furthermore, we believe that the project is in keeping with the goals and objectives that have been expressed in the initial phase of the Mill River Watershed Plan currently under development by Save the Sound. Please feel free to contact me with any questions you may have with regard to our support of this project. Committee Updates – More Summer Music! Thanks to everyone who attended the fundraiser for the Whitneyville Branch Library on Friday, April 27! For those missed it, you can see video and photos at our Facebook Page: https://www.facebook.com/WhitneyvilleCivicAssociation/. Support your local Whitneyville Branch Library, the heart of our community, and celebrate Spring at the same time. Join friends and neighbors on Friday, April 27th from 6-8 pm at The Playwright Banquet Room, located at 1232 Whitney Avenue. Enjoy complimentary appetizers, a cash bar and readings by Hamden poet laureate Franz Douskey. 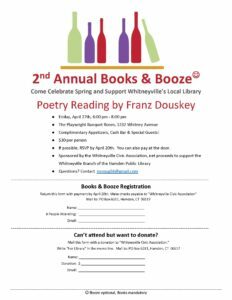 Lightheartedly called “Books & Booze” (with alcohol optional of course), net proceeds will be used by the Whitneyville Branch of the Hamden Public Library to support expanded programming and provide additional resources for residents and families in the community. Tickets are $30/person. See our flyer for details. You can also RSVP online. Or just come to The Playwright this Friday! Join Hamden Mayor Curt Balzano Leng at a Press Conference and Rally at the State Capitol in Hartford on Weds. April 25, 11:30 am to Demand that Hartford fills the Car Tax Deficit Pothole in our town budget! How is it that after a year’s worth of promises that Hamden, Torrington and Bridgeport would be made whole on the car tax loophole, we find out now that our town has been offered less than 40 cents on the dollar? These three Alliance grant towns have already cut personnel and services to the bone after years and decades of under-funding in ECS (Education Cost Sharing) dollars. Let’s tell the state legislature IN PERSON what the loss of millions of dollars is doing to our town budget! Let’s remind our legislators that we were PROMISED that we would be made WHOLE after passage of the state Car Tax Mil Rate Cap. How are we to find more cuts when our property taxes are three of the top ten in the state and our budgets are already stretched to the breaking point by decades of under-funding? The loss of this revenue means cuts to schools, cuts to libraries, cuts to public safety, and cuts to necessary infrastructure maintenance. Hamden, Torrington and Bridgeport have three of the top ten Mil rates in the whole state of Connecticut, and now we’re expected to do more with less? Enough is Enough! Bring a sign, bring your voice, bring your story! A promise is a promise and Hamden needs to get full restoration of the car tax deficit!! We know that most people are at work during weekdays, but if you can spare a long lunch, or know anyone who can join us for the rally, our many voices WILL make a difference. Press conference at 11:30am at the Capitol Building with Hamden Mayor Curt Leng and other elected officials. Rally and protest to follow. Bring a sign, bring your voice, share your story — Hartford needs to fill our Car Tax Pothole! Please visit the Facebook event page created for this rally for updates! And feel free to share this message through your networks! Support your local library, the heart of our Whitneyville community, and celebrate Spring at the same time. Join friends and neighbors on Friday, April 27th from 6-8 pm at The Playwright Banquet Room, located at 1232 Whitney Avenue. Enjoy complimentary appetizers, a cash bar and readings by Hamden poet Franz Douskey. 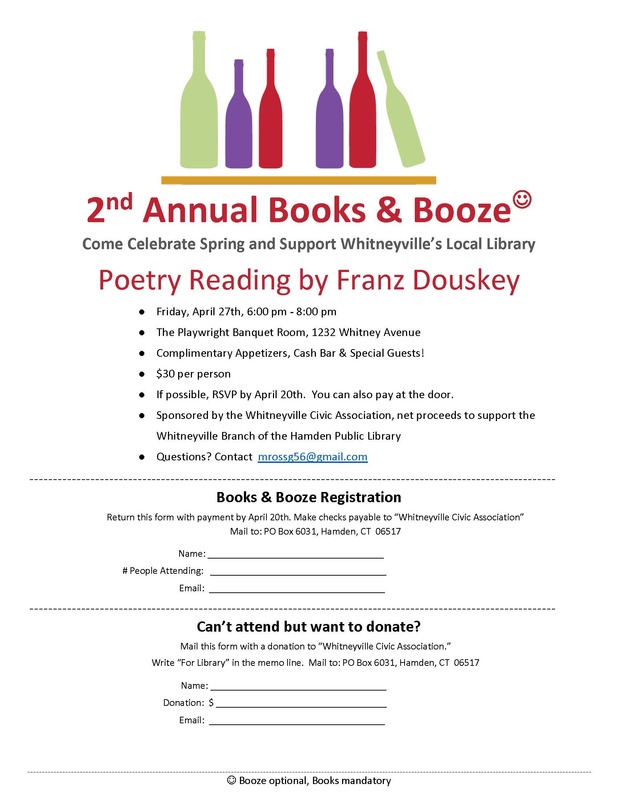 Lightheartedly called “Books & Booze” (with alcohol optional of course), net proceeds will be used by the Whitneyville Branch of the Hamden Public Library to support expanded programming and provide additional resources for residents and families in the community. Tickets are $30/person. See our flyer for details and to mail in your donation. You can also RSVP online. Sponsored by the Whitneyville Civic Association. We are writing in support of the Hamden Public Library branches. Our local Whitneyville branch is a “local gem” that offers valuable resources and services while bringing neighbors of all ages and backgrounds together. Created a refurbishment plan for the Whitneyville branch and worked with the Library Board and the town to implement the first phase of the plan (including planting new trees and painting the exterior). Held our first fundraiser to support the Whitneyville branch, which raised more than $2,000 from 100+ donors. Held an evening of poetry reading by local resident Bruce Coffin in November. Held a Saturday morning family activity with local award-winning children’s book author and illustrator Deborah Freedman for Take Your Child to the Library Day in February. Are planning a second annual fundraiser on April 27 at 6:00 pm at The Playwright. We hope you can attend! A Local Gem. A neighborhood library is more than just the books inside a building. It is a cultural and community center that invites and inspires people to learn and become active members of the neighborhood. The Whitneyville Branch Library is an invaluable asset to our neighborhood. It provides much more than merely books. Access to DVDs, newspapers, and the Internet is available‐‐for free. It functions as a public space for community members to meet formally and informally‐‐for free. A library is also a quiet space in which to read, think, and discover new ideas, or just meet new people. The Whitneyville Library’s design invites you to enter it. Its generous glazing allows you to see the sky and trees and the changing seasons, adding to the experience a library can provide. Providing accessible resources for residents of all ages, incomes, and ethnic backgrounds, which is of particular importance to those who might otherwise have a hard time paying for, traveling to, or even finding equivalent resources elsewhere. The branch is within an easy walking distance from residences, elderly housing, and nearby bus stops. Walk into our branch any day and you’ll see a vibrant place filled with children, parents, seniors and adults from all walks of life. Bringing people to the neighborhood, which benefits local businesses as well. Increasing home values and attracting home buyers. For a semi-urban community that wants to attract and retain young families, libraries are an important community resource. Supporting Community Development. The branch libraries help support the town’s development efforts targeted at Southern Hamden. For example, the town just applied to have federal Opportunity Zone funding go to the same Census tracts that surround the Brundage branch (http://www.hamden.com/qcontent/NewsFeed.aspx?FeedID=1515), and is starting a Neighborhood Revitalization Zone (NRZ) to revitalize the State Street corridor. Branches Where the People Are. While it is true that the branch libraries are relatively close to each other, this makes sense given the population density in these neighborhoods. All you need do is look at the political district map of the town to see how compact the southern Hamden districts are (where each district has close to the same percentage rate of the population). The less densely populated northern Hamden is served by virtue of its proximity to the much more extensive services – compared to the branches – of the Main Library. While we realize Hamden faces difficult budget choices, we believe that the branch libraries are a critical investment in our neighborhoods that contribute to a thriving Hamden with a strong local tax base. The Whitneyville Progressive Action Network created a one-page reminder on how to keep our neighborhood clean. Just in time for April, which is bulk trash pick-up month. Keep Our Neighborhood Free of Illegal Dumping! You can put it out by the curb during April and October and the city will pick it up. Please note that the town cannot pick up TVs. During the months in between, you can put something out in the hope that someone will pick it up. However, please don’t put it out for more than a couple of days and only in good weather. Salvation Army: (203) 230-2323, 1359 Dixwell Ave. Goodwill (203) 248-1600, 2901 State Street or 2369 Dixwell Ave.
Take to the town dump. 341 Wintergreen Ave. in New Haven (203-387-2435). Bring ID to prove residency. The town dump will accept TVs. Residents on this site can notify the town about issues in their neighborhood, upload photos, and track the town’s response. You don’t need to identify yourself. Call Hamden Planning and Zoning (203) 287-7070 and report the problem. Be sure to give the address where the garbage has been dumped. You don’t need to identify yourself. Ask your neighbors to do the same! A volume of calls is more likely to be effective. One way to do this is to post the information on NextDoor.com https://nextdoor.com/ and ask others in your neighborhood to report it. You can upload a photo on NextDoor as well. Feel free to copy this notice and give it to your neighbors! We live in a beautiful neighborhood! Let’s keep it that way!